When you stay at the Hampton Inn Northwest Park 100, Indianapolis, Indiana you'll be near a great arts community and many things to do outdoors. Eagle Creek is a park which has 5,300 acres, 1,400 of which are water-perfect for sailing, strolling or bird-watching. Racing fans will enjoy Indianapolis 500 and Brickyard 400. There are many teams to watch in this town. If you like museums, visit Indiana State Museum and Indianapolis Museum of Art. There's also the Indianapolis Children's Museum. Take your family to Indianapolis Zoo where they'll see all kind of animals. Also, while you're at the zoo, you can visit the beautiful White River Gardens which is 3.3 acres. Some of the restaurants in the area include Bob Evans, Longhorn Steakhouse and Gadsby's Tavern Restaurant. Ask the friendly staff if you have questions or need anything. The Hampton Inn in Indianapolis, Indiana has 121 guest rooms with an assortment of amenities such as coffee makers, irons, ironing boards and hairdryers. Bathroom amenities include night lights and curved shower rods. You get a good night sleep on a comfortable Hampton bed with signature bedding and pillows. You have the choice of non-smoking rooms with queen or king size beds. You can also choose a spacious suite. Accessible rooms are available for those with disabilities. 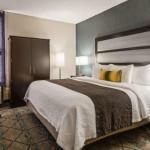 The Hampton Inn in Indianapolis, Indian is ideal for business or pleasure travelers. Eat a complimentary breakfast in a relaxing breakfast area. Keep your valuables in the safety deposit box. Swim in the pool or work out in the fully equipped fitness room. Business travelers can do their work with the help of the business center, photo copying service and printer. You can feel secure with this hotels audible alarms, electronic locks, electronic smoke alarms, secondary locking devices, double locking doors and more. Shop at hte on-site convenience store or gift shop.